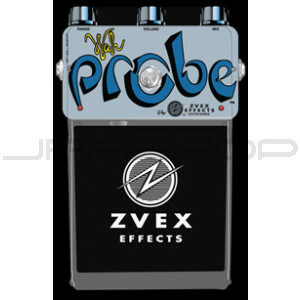 This effect is a natural continuation of the probe series... the fuzz factory probe, the volume control/manual tremolo probe, and now a wah. It's probably exactly what you think it is: a theremin-style antenna controlling a wah, getting brighter as your foot approaches. It has one extra feature, however. There's a Super Hard-On boost circuit in front of the wah, with a knob to set the exact level of boost for driving your wah sound. It can be turned up high enough to make the wah crack up a little for that "something's gonna blow" sound. It gets pretty darn loud! The simplest one of these is the volume level of the "drive" knob... just set it so that when you kick on the wah it's doing its stuff at the right intensity. It goes from slightly lower than the normal guitar volume to completely bonkers when turned up all the way. I personally don't think it's necessary to turn it up all the way, in fact, it seems to pretty much obliterate the wah sound, but, to each his own. Abuse those transistors, please! The other adjustment isn't too intense... it's the LED current control. You can usually leave this one at exactly halfway. That's how I usually ship the unit. If you think the wah is too bright when your foot is all the way on it, just turn this control to the left to make it a little duller at the top end. I ship it so that with a pair of heavy Doc Martins (the rock and roll shoe of choice for many musicians) my foot will make it go from muffled to very bright. The unit works well with any kind of nine-volt battery. Naturally, a nice alkaline cell will last quite a bit longer than a carbon-zinc one, but some people are completely sold on the sound of the higher voltage output from a carbon-zinc unit when it is brand new. To change the battery, unscrew the four screws on the underside of the painted box. Carefully lift out the old battery and replace it with a new one exactly as it was installed, with the clip toward the right as you look at the bottom when the plastic footpedal part is aiming toward you and the painted box is further away. Does that make sense? ENJOY! If you have any problems be sure to contact me.